The Outline View displays all of the programs in a file that is open in the Editor. Clicking on a program name in the Outline View will highlight the declaration in the Editor. If the declaration isn't currently visible, the Editor scrolls to make it visible. See the figure above for the location of these buttons. 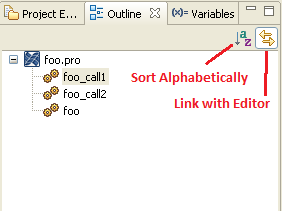 Sort Alphabetically - Lists the programs in the file in alphabetical order. The default is to this the programs in the order they appear in the open file. Link with Editor - Toggles the linking of your files to the Editor View.